As the 11th season of Indian Premier League (IPL 2018) is coming closer, with the return of Chennai Super Kings (CSK) and Royals (Rajasthan Royals - RR) there is huge excitement among the fans. 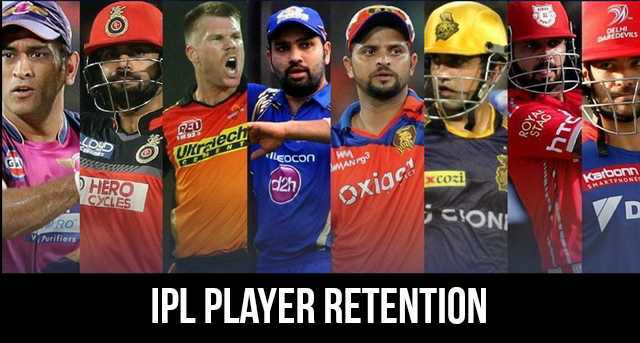 This year before the IPL 2018 auction, new player retention policy has been finalised by the IPL Governing Council and the Committee of Administrators (CoA). RTM (Right-To-Match) Card, is an option available to team retain its player after the auction. To retain the player the team has to bid the exact same amount at which the player is sold at the new auction (IPL 2018 Auction). How many players can be retained from each category? CSK and Royals are returning to the tournament after two years of suspension. They will be replacing Rising Pune Supergiant (RPS) and Gujarat Lions (GL). CSK and RR are allowed to retain or use RTMs for the players who were part of their respective team in IPL 2015 and later went to play for RPS or GL. Players of CSK and RR who played for teams other than RPS and GL can be retained (cannot retain by CSK/RR) or will go to the auction pool. Players who joined RPS or GL as their first team will be in the auction pool. Players CSK can Retain: MS Dhoni, Ravichandran Ashwin, Faf du Plessis, Baba Aparajith, Ankush Bains, Suresh Raina, Ravindra Jadeja, Dwayne Bravo, Brendon McCullum, Dwayne Smith, Andrew Tye, Irfan Pathan and Ishwar Pandey. Players RR can Retain: Ajinkya Rahane, Steven Smith, Ankit Sharma, Rajat Bhatia, James Faulkner and Dhawal Kulkarni. Retention price will be the deduction from the salary cap; for IPL 2018 salary cap is set to Rs 80 crores. And each team has to spend 75% of its salary cap until the auction. If three players are retained than the franchise has to pay a total of Rs. 33 crores. Rs. 15 crores to the first player, Rs. 11 crores to second player and Rs. 7 crores to the third player. If two players are retained than the franchise has to pay a total of Rs. 21 crores. Rs 12.5 crores to the first player and Rs. 8.5 crores to the second player. If only one player is retained than the player will get Rs. 12.5 crores from the franchise. And if the franchise wants to retain an uncapped player before the auction that will have to pay Rs. 3 crores.